Rapala's Floating Fish Gripper/Scale Combo comes with a 9" Floating Fish Gripper and a 50lb. mini digital scale. You have the convenience of securely holding your fish because the fish gripper will attach to the scale. 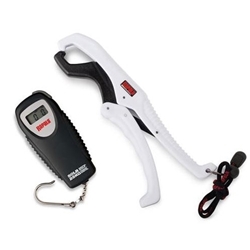 The scale features a chrome plated hook, is water resistant, and has a 4 minute auto shut-off.